Raising a child requires a good deal of research and knowledge. Raising a child on the autism spectrum requires all that, and a little more. Children on the spectrum often have needs that require additional resources to fulfill. If you’re looking for toys and games that will appeal to your child, we’ve gathered ten of the most popular and developmentally sound products on the market. The following products are meant to be useful to kids with sensory sensitivity, and some of them are even utilized as therapeutic exercises. They’re safe, will help refine developmental skills, and are bound to bring lots of joy to your family. We have reviewed each toy for kids with autism on this page and created a list with the 10 toys from the current marketplace. Each product has an updated status and the criteria sections have also been upgraded. With thirty pegs in six different colors, this set is bound to appeal to young eyes. A large foam pegboard gives little ones a place to begin construction and work their color sorting and organizational skills. 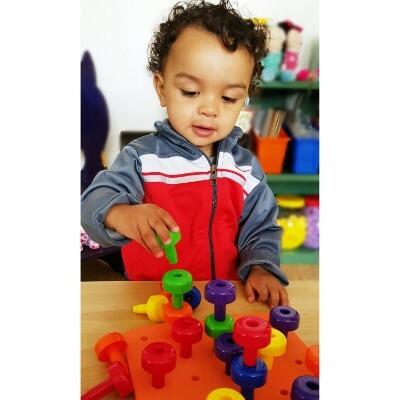 Oversized pegs are perfect for tiny hands and fingers, being easy to pick up and maneuver. Children can build all sorts of structures, and a downloadable guide can be read from your tablet or smart device, or printed to help assist the fun. Safe for children ages two and over, these pegs are a great occupational therapy activity, for children or adults. 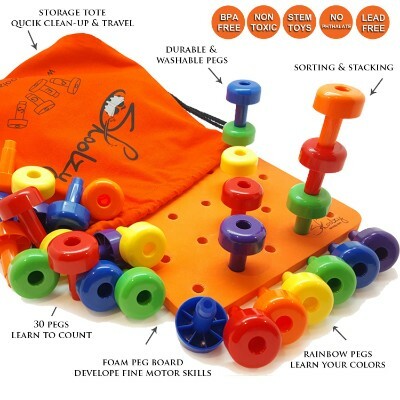 It assist with pattern recognition, basic math skills, fine motor skills, and more. A drawstring toy bag makes the pieces easy to store and travel with. 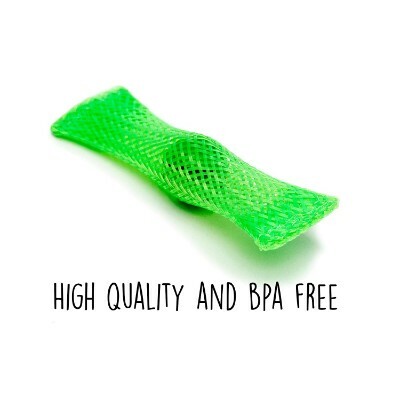 Certified Non-Toxic, Lead- and Phthalate-Free, and BPA-Free, these pegs are safe and simple, easily washable with soap and water, and no hassle to clean up. Give your children the colorful afternoon that they deserve with this rainbow set! Construction sets are a great way for kids to work fine motor skills, hand eye coordination, math skills, pattern recognition, visual perception skills, and more. 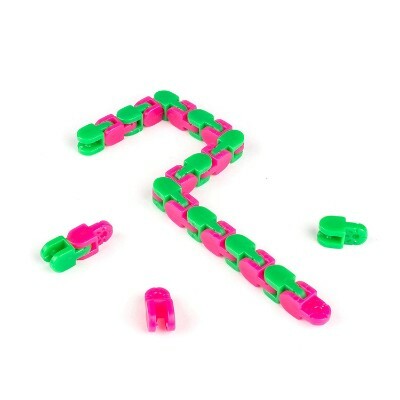 These pegs are colorful and just the right size for tiny hands to be able to use without frustration. It’s a fun, unique alternative to LEGOs or DuploBlox. These little pegs are fun and easy to build with. They’re colorful, and the emailed PDF guide helps children and parents truly get the most out of the toy with suggested learning activities. Officially called the trapezoidal icosatetrahedron, the Hoberman Mini Sphere is one of the most functional gifts for autistic child simply because of its complex simplicity, whatever that is. Looking at the Hoberman in its collapsed form and you’d think that it’s just like any other ordinary ball about 5.5 inches in diameter. However, picking the Hoberman from any of its few dozen points and this seemingly ordinary ball expands to a lattice-like, star-like globe that spans a full 12 inches across. Thrown or rolled in a certain way and the Hoberman’s star-like features hold up really well providing any kid, or adult for that matter, with enough sensory input to stimulate his or her imagination. Pick it up in the wrong point and the Hoberman collapses into a ball more like a highly defensive hedgehog. 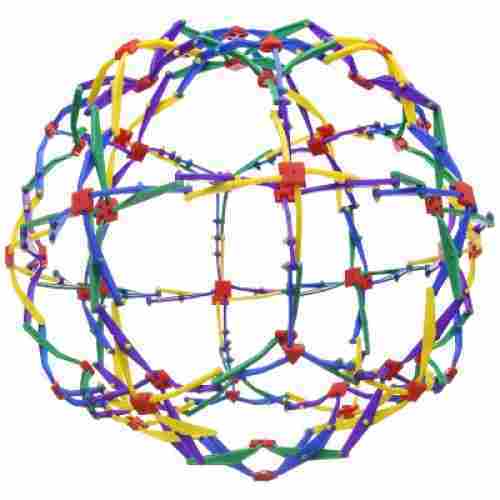 So, if you are actively looking for sensory processing disorder toys, then the Hoberman Mini Sphere can help. This wonderful sphere expands when thrown making it a great toss-game throw toy. It stimulates excitement and small children can carry it with them easily because it is so lightweight. The simplicity of the expanding/contracting motions of the Sphere provide the autistic child with the repetitive motions needed for busy brain activity. The Sphere is a wonderful sensory toy that will fascinate for hours on end. 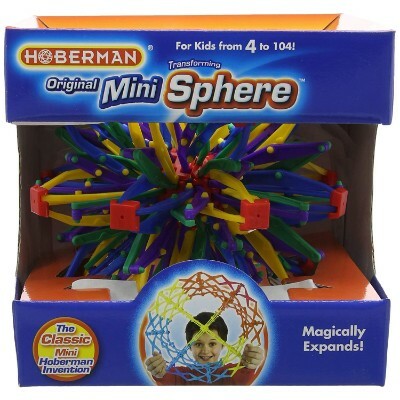 The Hoberman Mini Sphere provides the best exercise to keep an autistic child’s mind and hands busy. This helps him or her take full control of his or her repetitive behavior. Additionally, we found that the Hoberman can be used as a very novel desktop ornament. There are many reasons why a person may be living with an overabundance of energy. ADD, ADHD, OCD, and autism are just a few explanations. Perhaps you have an anxiety disorder or maybe you’re just a nervous test taker. 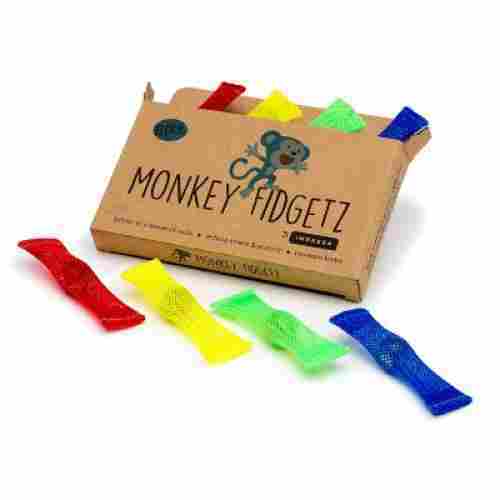 Regardless of your personal reasonings for using a fidget toy, teachers, parents, and therapists all agree that by providing a simple stimulation that keeps your hands’ busy will, in turn, focus your mind and help relieve stress. Impresa Product’s Mesh-and-Marble Fidget Toy is the ideal choice for a fidget toy that can be used in situations where noisier toys would cause a distraction. This could be waiting at a doctor’s office, listening to a lecture in class, or even at your desk in the office. Whatever and wherever your need, these mesh toys are waiting to set your mind at ease and get you back on task. Since several are included in each package, there is no worry if one or two are lost. These little bags may appear simplistic and in truth, they are, but simple toys often work best when it comes to calming the anxiety or stress concerns that accompany many forms of autism. They have been safety tested for use by both children and adults and can help promote a sense of calm in those with an overabundance of energy. Sliding the premium metal marble against the rough mesh of the bag is a gentle sensory experience and can help focus your child’s mind. 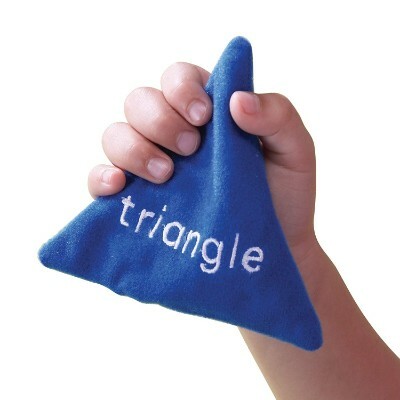 This particular style of ‘fidget’ toy is perfect for school as it provided a silent distraction and it is small enough to easily slip into a pocket on the way out the door. These small mesh bags are the perfect silent fidget device to help keep your focus during class or while studying. 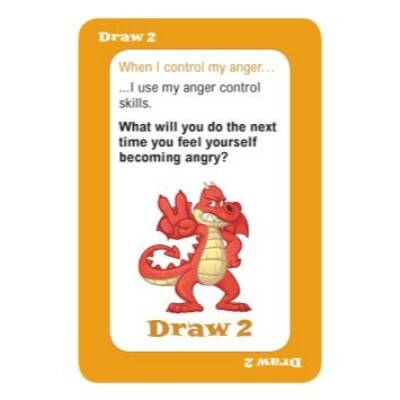 Played in a similar fashion to the popular card game, ‘UNO’, Mad Dragon: An Anger Control Card Game is a fun and thought-provoking way to introduce your child to several different anger management techniques. Play a red 4 and tell about a time you felt only a little angry. Wild’s change the color, and also present an opportunity to name something that makes you angry and tell how you can avoid it. The aim of the game is to see who can empty their hand of cards first. Most, but not all, of the cards contain discussion cues or questions that can be answered when you play a card, when you discard a card, or even when you draw a card. You can have the person who plays the card answer the question alone or everyone at the table can answer. There is a multitude of different ways to play! 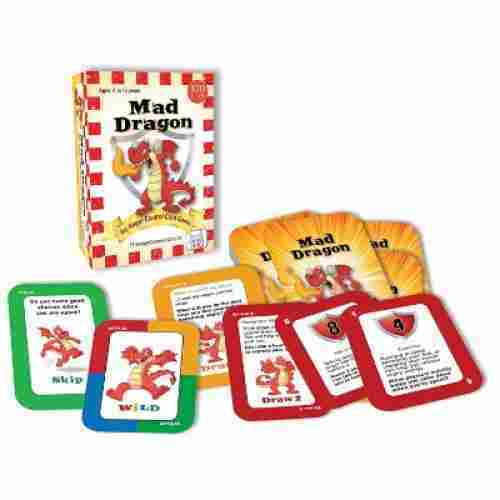 You will be pleasantly surprised how the familiar game style and playful card format can relax your child and make them more open to talking about their anger. It can also provide jumping off points for you to share your own experiences with your child and help empower them to control their emotions. 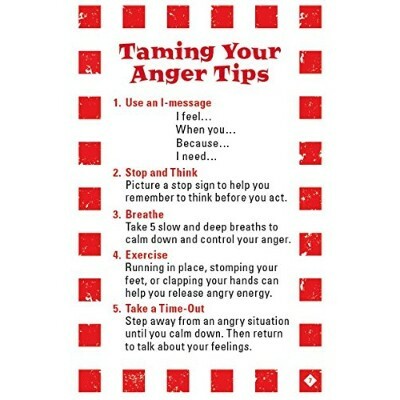 This fast-paced card game presents an ideal way to showcase different ways to not only recognize situations that may cause anger but also how to deal with that anger in a healthy and productive manner. 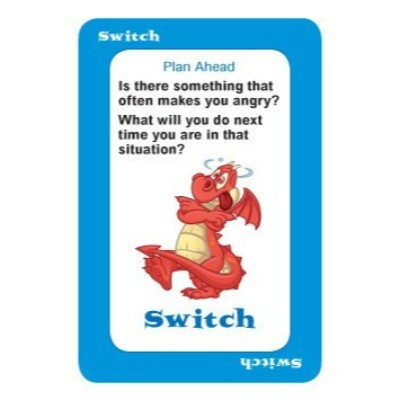 The simplistic language on each card is easy to understand even for younger children and can help present talking points that foster discussion about why your child is feeling angry. This is an ideal tool for therapists and teachers as well. This game is really two things in one, an enjoyable card game that can help promote familial bonding and a therapeutic tool that can help open discussion points with children who have trouble managing their anger. 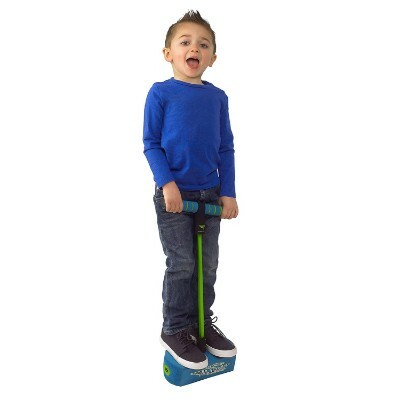 If you are looking for more fun toys for children with special needs, we’d highly recommend the My First Flybar Pogo Jumper. This can really help your autistic child have fun and take his or her mind off whatever is causing anxiety. Plus, it can get your child into fitness so he or she will be a lot more prepared to manage his or her stresses. 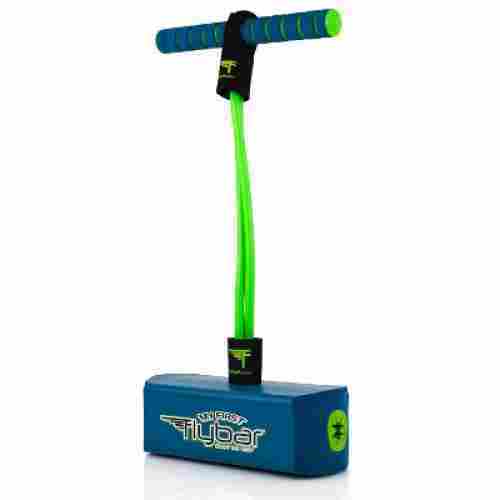 The Flybar consists of a very durable yet soft foam base attached to an ultra-strong and hyper-elastic bungee spring. The handgrips are wrapped in soft foam to provide absolute comfort while your kid is hopping around. The whole idea about using the pogo jumper in the management of autism is anchored in its ability to provide a distraction for the mind. Because the brain will have to coordinate the muscles that are required for hopping and landing while maintaining optimum balance, the brain will no longer have the time to think and process stressful information that can worsen the symptoms of autism. The Pogo Jumper provides the autistic child with more than just a fidget toy for the hands. It is a full-body stress reliever that stimulates brain and muscle coordination. This mostly foam-covered toy is easy to manipulate by four-year olds and up and getting on and off is quickly learned. 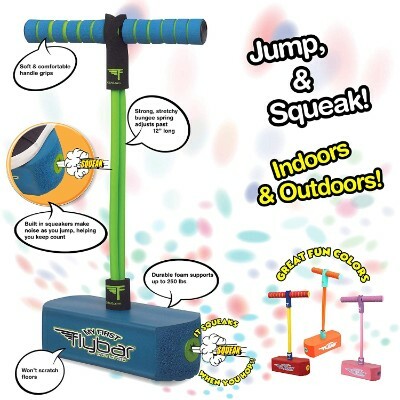 The Pogo Jumper is a safe, healthy toy that will keep kids busy for hours. 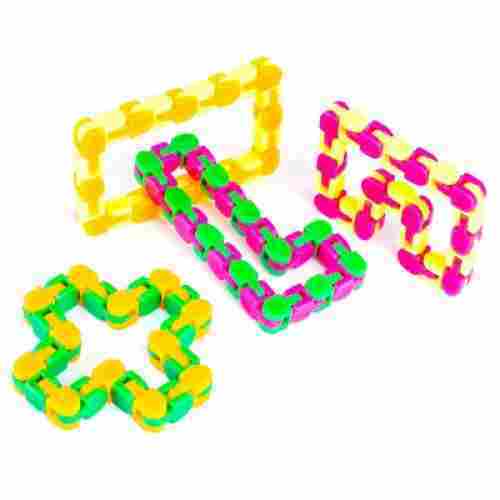 It also builds coordination skills that regular fidget toys cannot provide. At first glance you won’t think of the My First Flybar as one of the most ideal gifts for autistic child. However, experts agree that as long as the mind is able to free itself from stress triggers, then you’d be able to manage the symptoms related to autism. 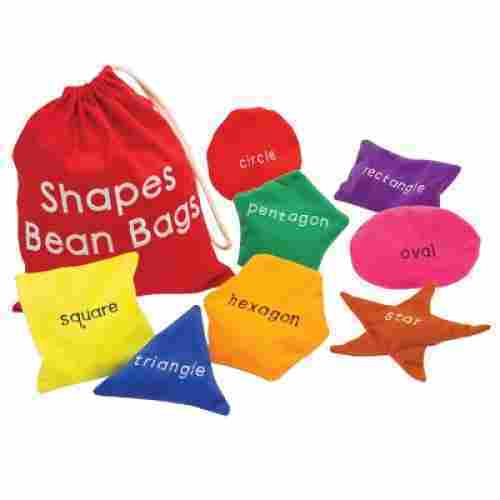 Brightly colored, super soft (so no chance of serious injury), molded into basic shapes, and labelled accordingly, this sweet little bean bag set is great for children learning basic shapes and colors. Throw them around for fun, or make differently shaped goals and holes to toss them in and score. If you’re feeling especially creative and want to play together, create a basic scavenger hunt for your child by hiding these around the house and giving them clues to help them find it. These bean bags are simple, well made, and highly versatile. The set includes eight bean bags and a carrying case. Each bean bag has the shape name embroidered onto it, so lettering won’t wash off or fade. They’re washable so you don’t have to worry about bacteria collecting, and constructed of a soft, lightweight felt so kids can handle and chuck them around easily without worrying about any real damage. The set includes seven suggestions for fun, hands-on games that children can play. This provides a wonderful tactile way for children with greater sensory needs to learn basic shapes and colors. Playing catch improves dexterity and hand eye coordination. And the bags are soft and light, so kids can handle them easily, making them a great way to keep little fingers busy and safe. You can play with these a variety of ways. The fact that they’re not heavy makes them a little trickier to catch, but also means that your child is less likely to incur any kind of injury as a result of play. They have their own drawstring bag, so clean up and travel with these is simple and quick. We all have trouble expressing our feelings, and children on the spectrum especially may be struggling to identify and communicate their emotions in a way that is effective for the family or their peers and teachers. 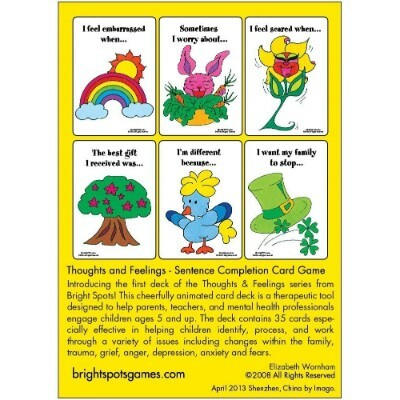 The Thoughts and Feelings Sentence Completion Card Game helps start important dialogue. 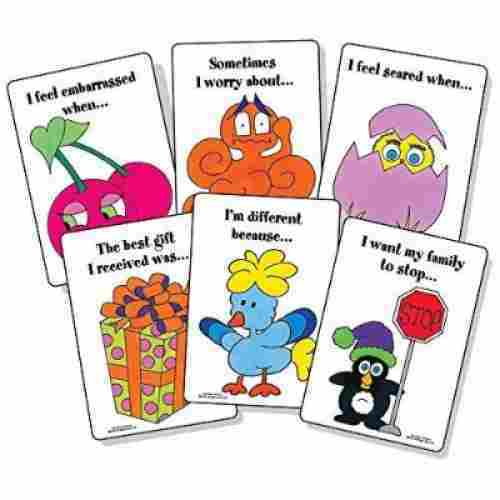 Cards feature fun, silly illustrations along with prompts such as “I feel scared when…”, “I’m different because…”, etc. Players then finish the sentence with their own personal thoughts and feelings. Targeted at children ages five to twelve, it can be a useful therapeutic exercise, and there are ways to play games with the cards that challenge memorization skills and different forms of communication. There are thirty five cards in total, and versions one and two can be combined for a more complete experience. This pack is version one, and appears as a winner on Dr. Toy’s 100 Best Products, and 10 Best Socially Responsible Products lists. This game helps children build important communication skills, as well as teaching them to identify their thoughts and feelings as they happen. Kids and adults can bond over similar thoughts and feelings, and discuss together the best way to cope with and navigate these experiences. This game is a good way to get a dialogue rolling between children and adults concerning feelings and how to handle them. It helps build understanding between family members, and can be used as a starting point when guiding children through healthy behavioral responses to tricky feelings. Sensory processing disorders can often cause children to have an aversion to many types of textures and surfaces that wouldn’t typically be bothersome. This occurs because their senses are over-exaggerated compared to the average. Imagine waking up every half an hour because there is a wrinkle in your sheets and it feels like a rock jabbing into your side. Or let's say you are having a conversation with someone but your brain is hearing every single sound in the room at the same volume as your conversation. That fly over there on the window? The dripping tap from the bathroom next door? They all sound as loud as if they were right next to you. It's completely understandable that this type of overloading sensory input would cause a lot of extra stress and anxiety in performing normal everyday tasks. 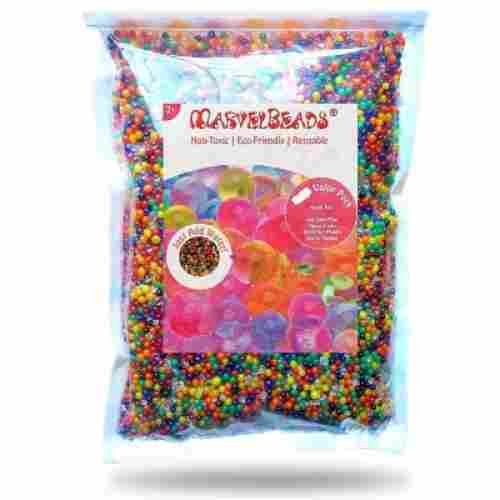 Sensory toys, such as the MarvelBeads Water Beads Rainbow Mix, provide a soothing and gentle sensation that can help reduce anxiety by providing a calming focus. 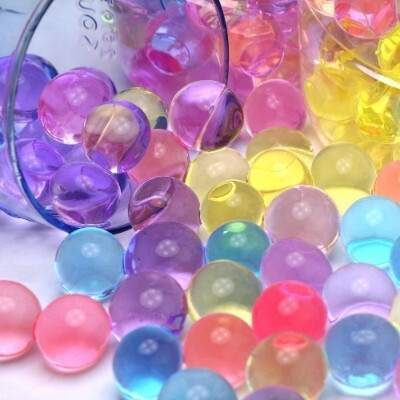 These beads expand into durable little water balls that will retain their shape and color through multiple uses and can be dried out and then reused over and over again. This 8-ounce bag is enough to fill an entire kiddie pool and are completely biodegradable so there is no concern if you lose a bunch along the way. These teeny beads are a perfect example of the old adage: “Great things come in small packages.” Make a game counting out how many green balls are in a handful and your little one will be learning everything from language to counting skills. Practice filling a small cup one bead at a time and you’ve got a great game to limber up little fingers and help those fine motor skills develop. Roll them in paint across a piece of paper and you’ve got a unique way to promote artistic creativity. The smooth texture provides a pleasant tactile experience for children afflicted with sensory disorders and can help calm anxiety and ease stress. 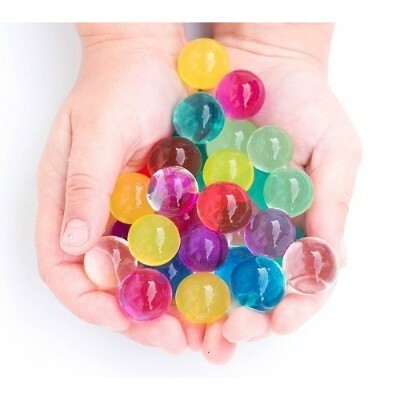 This a sensory toy that keeps on giving, one tablespoon of beads uses an average of 10 cups of water and produces a HUGE bucket of squishy, squirmy fun! 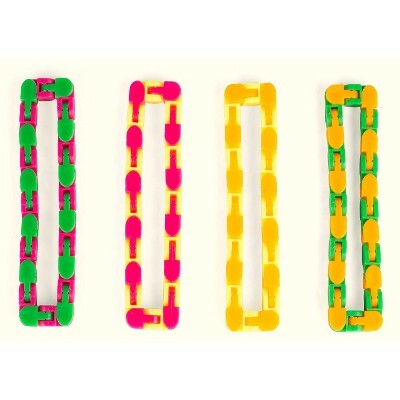 This colorful pack of four contains vibrant chains meant to focus attention, reduce anxiety, decrease stress, and promote fine motor skills. Each loop features twenty four pieces, each of which snaps into five different positions, meaning there are hundreds of options when it comes to making shapes. A pivoting system allows the links to be molded into fun 3D forms. Snapping the links together emits a “click” sound which many children find to be satisfying. The toy is recommended for ages two months and older. Snap a few together to get longer chains and more room to build and create, or play with them as they are. They are small enough to carry in your purse or pocket, so they’ll be handy whenever your family needs them. Just know that the clicking sound is always present, so these might not be the best option for situations that require silence. Supervise young children who might still be interested in chewing on new things, as the pieces do come apart into smaller links. These fun fidget toys build fine motor skills, increase problem-solving and deductive abilities, work dexterity and hand eye coordination, and quiet overactive little minds. 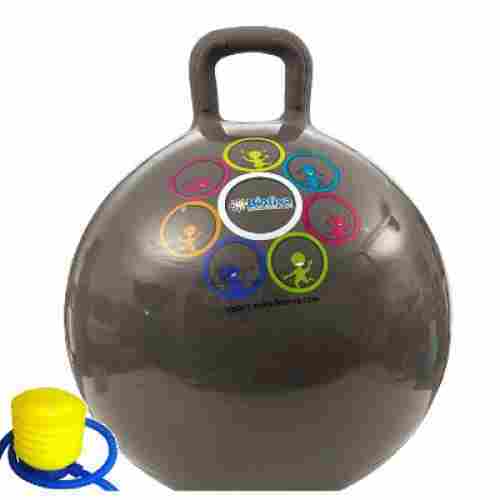 If you’ve been using a stability ball in the gym, you can look at the Hippity Hop as something very close to that but with a handle for your kids to hold onto. 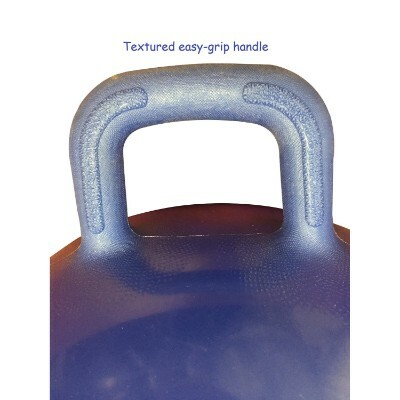 In fact, we’d prefer to call it a gigantic kettlebell because of the handle. These toys for children with special needs provide the focus needed by these kids. 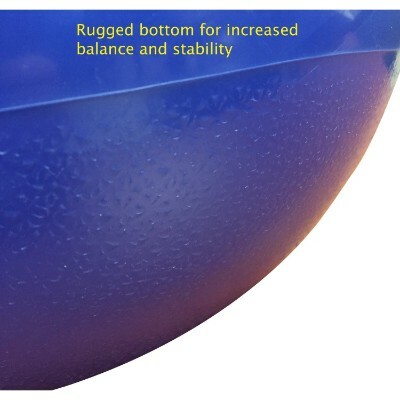 By keeping their balance while sitting or lying on the Hippity Hop, they are essentially telling their brains to keep busy with the maintenance of balance so kids will not fall. The Hippity Hop can be an excellent workout for kids to strengthen their core muscles, giving them another reason to enjoy life, and focus on these instead of their autism. The Hippity Hop comes with a foot pump to allow for fuss-free inflation. The Hippity Hop ball is one of the all-around physical stress relievers for the autistic child that can be used indoors or outdoors. It is also mentally stimulating because coordination and balancing skills are required to get on and off and stay on while bouncing. The exertion from bouncing will wear out and creatively use up the energy from even the most energetic child. 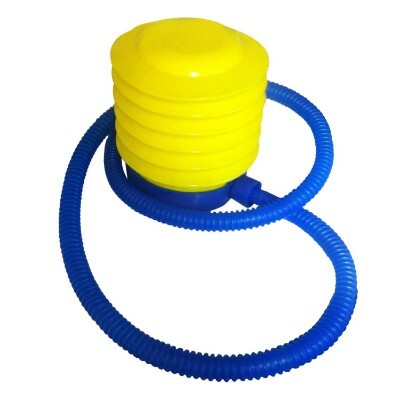 The added benefit from such a physical toy like the Hippity Hop is that while it relieves stress, it will also build the muscles in the legs. Aside from the obvious benefits of total concentration and focus which can help autistic children, the Hippity Hop can also be beneficial in enhancing vestibular orientation and the proprioceptive senses. Besides, it’s highly recommended by occupational therapists, physiotherapists, and even educators. Because of the needed repetitive motions and use of toys for autistic children, the toys they play with must be able to handle rough treatment. Durability is one of the most important factors when searching for toys for these children. Stress and anxiety causes them to finger, rub, and hold their toys more often than other children, so the materials used in construction of the toys must be the number one concern along with the safety of the toy. It is important to match the proper age level of the child with the toy he/she will be using. Smaller children may misuse toys or be harmed by removable or moving parts. Also younger children may not derive pleasure from toys that they cannot yet use or understand. Most of the toys reviewed here can be used from the age of 3 years old and up. Even adults have used and enjoyed these toys to relieve stress at work and while relaxing at home. Toy size is important because it may indicate how often the child will play with the toy. Toys that can be easily carried or tucked away in pockets will, of course, be used more often and in more places than larger items. Lightweight toys are more popular, especially with younger children because they can easily carry them and travel with them. When working with a child with ASD remember to always be consistent. The toy time should always be presented in the same fashion with some of the same toys. When adding a new toy remember to talk to them about the experience and always include interaction based around the new toy. Children with ASD need time for fun just like everyone else. Therapy and schedules are important, but having fun is right there on the top of the list, as well. Make sure they laugh, smile, and allow them to come out of their shell. Probably the most important aspect of these toys for autistic children is whether they actually entertain the child like it is supposed to and how effective is it in developing the skills they need. All of these reviewed toys entertain and build skills at different levels. It really depends on the age of the child as to which toys are appropriate for them. The younger children in the 3-4 year-old range would welcome the toys that are easily handled and simple to operate or fidget. Older children have the coordination to manipulate the more physical toys to relieve their stress and anxiety. Toys properly matched with the age of the child should entertain for hours and help build the skills desired. We are not child psychologists nor are we autism experts. We nevertheless, know exactly how parents feel when they first learn that their child is autistic. We have encountered many of them and we share in their angst and frustrations and have made these as our learning points in coming up with this list of amazing sensory processing disorder toys. First, we had to look at the toy’s developmental appropriateness. We know that different autistic children at different stages of development will require slightly different sensory stimulation. For example, an autistic infant will often have problems responding to social stimuli. On the other hand, an autistic toddler will have problems with taking turns. Knowing these subtle differences in autistic children helped us determine whether a particular toy fits a developmental purpose. Otherwise, we might as well scrap the item and move on to the next in our long list of gifts for an autistic child. So, the very first thing we had to look for is the toy’s appropriateness to the age and development of the child. Secondly, we needed to make sure that these products are made of only the safest and highest quality material and underwent a manufacturing process that adheres to strict quality control standards. Products that were subjected to voluntary testing, evaluation, and certification were deemed to be more credible than products that required mandatory testing. We believe that a company that voluntarily puts its products to be tested and evaluated is very confident about the quality workmanship of its products. This is also an excellent sign of a company’s overall reputation. Third, we knew we had to listen to what parents of autistic children have to say about these sensory toys for autism. We must be able to back up our decision to include one particular toy but not another by combining our near-objective product evaluation with the experiences of moms and dads everywhere regarding their children’s use of these products. Autism is quite a very touchy subject. But we also know the predicament of parents who love their autistic children so much. That is why we have chosen to embark on this seemingly impossible mission to provide you with a selection of the most amazing toys for special needs. Three of the most recognizable manifestations of autism are impaired social interaction skills, difficulty in communication, and repetitive behavior. Unfortunately, because of the rather inorganic nature of the condition, scientists are baffled as to what actually causes it or what the underlying mechanisms are. There are those who say it’s genetic while others point to environmental factors. What we do know is that autism affects more than 20 million people worldwide and all of them have been diagnosed as autistic during their early childhood years. There are many who are concerned about what the future brings for children with autism. It should be understood that while autistic children will have problems in their social interaction, communication, and motor behavior, many have fantastic cognitive abilities. This is because there are many different kinds of autism. One of the most celebrated and most often cited forms of autism is high functioning autism or HFA. In many instances, this is often mistaken for Asperger’s Syndrome, another form of autism. The fact of the matter is that, since children will only have developmental delays or problems in certain aspects of their neurodevelopmental growth, many tend to compensate for these deficits by doing well in other areas. For example, Dan Aykroyd of the Ghostbusters fame is known to have Asperger’s. Perhaps the most iconic example of autistic individuals doing exceptionally well in their chosen fields of endeavor is Prof. Temple Grandin, TIME Magazine’s 100 Most Influential People in 2010. There are other very successful individuals who are experts in their field despite having autism or Asperger’s. This is just proof that autism is not really a disorder but rather a state of being different, of being unique. It is therefore, important for us as parents of kids with autism to provide them with all the opportunities to develop their other skills and not just their communication and social interaction skills. We can provide them with toys that are specifically designed to help control the repetitive behaviors of autistic children as well as provide the correct tools to help improve their social interaction skills and language and communication. More importantly, we have to recognize that help is available to those of us who really need it. q: What age group are these toys for? Most of these toys are for the age group of 3 years old and above. Children younger than 3 would not be suited for these because they would not know how to use the toys properly. Children older than 5 or 6 would still love these toys because there are adults that love them too. q: Does the toy stand the repetitive motions of continued use? 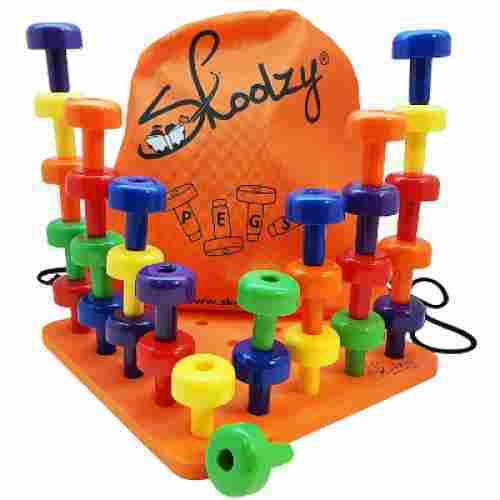 All of the toys reviewed are built for the repetitive manipulation movements that an autistic child would require of a toy. The idea of needed fidgeting and constant handling of the toy seems to be why these items were created in the first place. Adults and children alike have the need to handle items constantly to relieve stress and anxiety, so these toys are perfect to do that. q: Are there any removable parts or does the toy come apart? A few of these toys do come apart, but that aspect is part of what makes the toy multi-purpose having a puzzle-like element as well. Autistic children can repeatedly take apart and put together the pieces as well as use the toy as a stress reliever as it was intended. All of the toys reviewed were made with safety in mind and should not harm the child because of removable parts or sections that come apart. q: Can the toy be used in an apartment (the physical toys)? All of the toys reviewed here can be used indoors or outdoors safely. None should cause any harm to furniture or floors if used indoors. q: Is it made of durable materials that will be safe? All of the toys reviewed are made of quality, durable materials to provide the utmost safety. The recommended ages for most of them are from 3 years and older, so safety had to be one of the most important elements required in the development of the toys. q: Why are these toys helpful for the autistic child? Because these toys allow the child to move parts repeatedly over and over and can stand the abuse of handling constantly, they relieve the anxiety and stress that often consumes an autistic child’s ability to concentrate. The two toys with the floating bubbles provide mesmerizing, slow movements that will captivate and delight even the most distracted child. q: Are these toys more expensive than regular toys because they suit children with special needs? q: Do these toys have any special cleaning instructions? No. Most of them are made of durable plastic or rubber, so they can be washed or wiped clean if they get dirty.